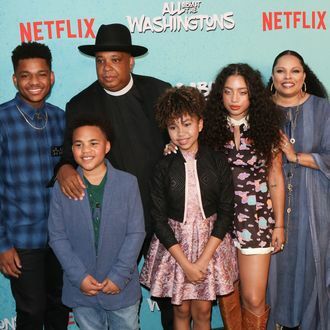 All About the Washingtons, the multi-camera comedy starring Joseph Simmons, has been cancelled by Netflix, according to Deadline. The show was originally produced for ABC, who passed on it; it then received a ten-episode series order from Netflix. The decision not to renew it comes two months after the season appeared on the platform. All About the Washingtons starred Simmons, who is also known as Rev Run of Run-D.M.C., and his real-life wife Justine Simmons, playing fictionalized versions of themselves. When the patriarch of the family, Joey, decides to retire from his illustrious hip-hop career, his wife Justine decides to start her own career, leaving the former music icon home to raise their four kids. The show was created by Jeremy Bronson.